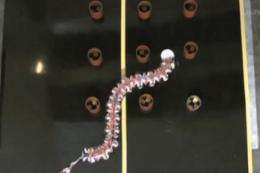 (PhysOrg.com) -- A University of Leeds researcher has drawn inspiration from biology to build a giant robotic worm that can wiggle its way around obstacles. The super-sized 'worm-bot' is modelled on the C. elegans nematode, a tiny free-living worm that uses an ultra-simple nervous system to control the way that it moves. Its designer, Dr Jordan Boyle, is hopeful that in future, the worm-bot could be used by search and rescue crews to send heat-seeking equipment into collapsed buildings or deliver aid to trapped survivors. "A future version of this robot could potentially navigate through irregular gaps and holes in buildings that had been damaged by fire, explosions or earthquakes," said engineering research fellow Dr Boyle, who carried out the work at the University's Schools of Computing and Mechanical Engineering. "Given the correct 'skin', the next version of this robot should also be able to deal with different environments. For example, it should be able to swim through water or crawl through snow or mud, even if it has to weave its way between natural obstacles, such as boulders or trees," he said. Dr Boyle's worm-bot is 2000 times larger than the 1 mm-long C. elegans worm. Unlike its natural counterpart - which has no skeleton at all - the robot has a rigid 'backbone', just like a snake. However, a series of springs along the length of its body give the robot worm-like flexibility. The system driving the robot forward is essentially the same as that of the C. elegans nematode - though with a few tweaks to improve the robot's performance. As a result, the worm-bot deals with obstacles in a very different way to other flexible, floor-crawling robots. Snake- or worm-like robots are typically propelled forwards by an 'ideal' wave that their control system has worked out in advance. When they meet an obstacle, the control system senses that something is hampering the way it wants to move and directs the robot to change its shape accordingly. In contrast, this bioinspired worm-bot is not interested in its surroundings and simply wants to wriggle from side to side. When it hits an obstacle, it doesn't need to know how that has altered the shape of its body in order to carry on - it just keeps on going, regardless. "The combination of the flexible control system and the 'bendy' body means that the robot adapts blindly to any obstacles that are preventing it from moving forward. Basically the worm-bot is thinking: 'go, go, go!'" Dr Boyle said. "At the moment, this does mean that the worm-bot has no idea where it will end up so there is a small chance that it might get stuck. A future version would just need to include an extra layer of 'intelligence' to the control system that could step in if the robot needed extra help to wriggle its way out of a corner," he added. It certainly mimics organic motion well. Pretty cool. I wonder if he's collaborated with others making these types of robots?